Looking for Fathers Day gifts? Having difficulties choosing a gift for Father's Day? Well, I thought I will search the net and see what kind of father's day gifts are available at different price range. And these are what I found - fabulous gifts that any dad will love to receive. I have classified them according to prices so that you will know whether it is within your spending budget for your fathers day gifts. Happy Shopping! Happy Father's Day! Pay a subscription for 1 year of dad's favorite magazine. Or choose one that is totally new to him from a wide range of magazines for men at the newstand or online. Dad will continue to receive his Father's day gift every month throughout the year till the next Father's day comes around. Click here to subscribe to any men's magazines. This is a exquisitely crafted bracelet made from high polished stainless steel oval links with 14KT yellow gold screw accents. Trendy and versatile. A limited quantilty edition. This was actually retailing at $195 but is now selling at only $108. I also notice that it comes with a beautiful small black pouch. A perfect gift for a trendy dad. Click here to buy this bracelet. Inviting and practical, this backpack is ideal for everyday use as well as for travel. Crafted of soft buffalo leather, the backpack is from the "Brazil" collection by Joao Carlos Silva. The design features several pockets and compartments ideal for keys, pens and cell phone. With a handle as well as shoulder straps, this backpack is the essence of style and functionality. 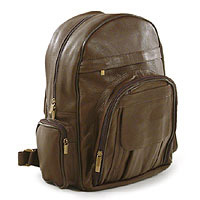 Click here to get this beautiful backpack for dad. "A classy cufflink design that features diamond and onyx set on 14K white gold. The total diamond carat weight is 0.44 carat. " A gift that any dad would be so proud to show off. And definitely something that he would be wearing very often. Click here to get this beautiful cufflinks for dad. 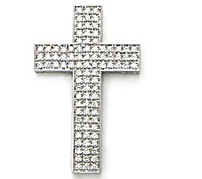 "This spectacular diamond cross pendant features a total of 2.27 carat of sparkling diamonds in round brilliant cut. " Beautiful! A gift that dad will surely love to show off to his friends and associates. Click here to buy this pendant for dad. Membership to a Fitness Club - Since lots of people are taking up exercising, I think this is a good gift for dad. A pen engraved with his name. Especially for a dad who loves to write. Gift voucher for a dinner for two. Choose a good restaurant with good food and great music. Give dad the gift of a relaxing evening. A golf club - this is for the golfer dad. A night at the movie. Has to be a great movie that dad will love to watch. Don't want dad to sleep through the show. A new computer for dad to surf the net - an Apple imac would be lovely. Car accessories. Every dad loves things to do with his car. A vacation to a country he always wanted to visit.